After the unsettled and prolonged weather over winter we have chosen the brightest and most cheerful plant for our plant of the month – the Hyacinth. We have had this spring bulb in our garden for many years and each spring they never fail to impress and be the centre of attention for a brief spell in early spring. One of the loveliest scents of spring, the heady fragrance can be captured many metres away. These bulbs do best in sun or partial shade in soil which is never waterlogged. As the colours can be a little bright we like to keep small clumps set amongst other spring bulbs, such as small daffodils and primroses. 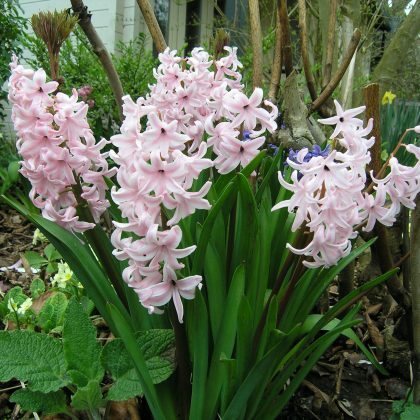 As with all spring bulbs, hyacinths sprout, bloom and start to fade into dormancy before deciduous trees fully leaf out, so you don’t have to worry about too much shade from nearby trees. Plant the bulbs in autumn.